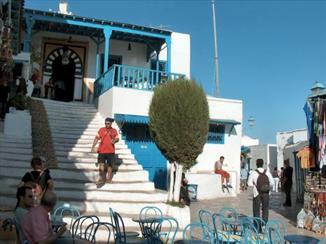 Sidi Bou Said is one of those tourist traps that retains its charm no matter how many loud tourists walk the streets. Sidi Bou Said is really just the one main road, going up the hill, ending in many fantastically situated cafés overlooking the Gulf of Tunis and the marina of Sidi Bou Said. Connected to this one street are short alleyways and some courtyards. Everything is well-kept with whitewashed walls and blue doors, windows and intricate metalworks. Streets have some vendors, selling handicrafts or sweets, but their business seems to run well, and they keep a low profile, as they have understood that keeping the atmosphere up is the best way of marketing. There are not very many things to do in Sidi Bou Said, the beach is crammed by young boys, making a swim for a woman here virtually impossible. The marina is quite good, and walking around you pass a couple of yachts as big as houses. The stairs going down from the mountain where the village itself lies, goes through green and luscious vegetation, but is sadly destroyed by litter. The best thing to do here, though, is relaxing in one of the nice cafés. Everything in Sidi Bou Said centers around Rue Habib Thameur. The road climbs the hill, passing at first well-maintained white houses, always with blue details and plants and flowers all over. It soon enters the zone of tourist stalls. All-absorbing as the shops always are, this is the place where you lose sight of Sidi Bou Said’s unique identity. But just for a little while. At its summit, the street opens up for a little while in an unnamed square. What makes Sidi Bou Said so attractive is that it still is a living village. Of course many of the inhabitants work with national and international visitors, but they are usually of local families with long histories here. Sidi Bou Said is not a place where anyone wishes move from, perhaps except when wealthy Tunisians buy a summer house here. The private parts of Sidi Bou Said starts immediately where Rue Habib Thameur ends. At the top of the climb of Rue Habib Thameur, there is a little unnamed square. Cafes take over from the shops and beyond this is only the tranquility of cool white walls and sea views. The square is dominated by the legendary Cafe des Nattes, a Tunisian institution. 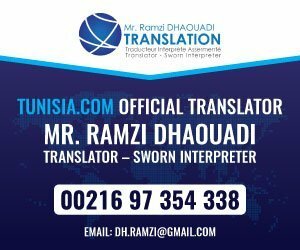 All Tunisian, with colourful interior and snotty waiters. The thing about Sidi Bou Said is that you have to climb to the top to get access to the sea below. Or actually, you may enjoy it best from Café Sidi Chaabane, which offers stunning views over the Gulf of Tunis, flanked by the mountains behind Hammam Lif. The climb down to the sea is nice by itself, the steps pass a few nice houses and some fresh vegetation. Just wish somebody could remove the litter. Nearby the sea, there is a marina of opulent Tunisians cruisers, as well as European yachts doing the North African coast. There is also a beach, not great, but good enough if you wish avoid the hassle of getting public transport to one of the other beaches along the coast. 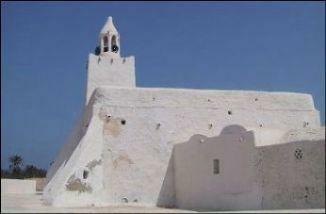 Sidi Bou Said offers a nice collection of hotels ranging from middle to high standard. There is no budget alternatives here. 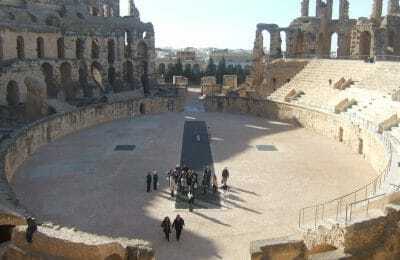 Budget travellers do best in going back to Tunis (20 km). Value for money is OK, but the main problem here is that Sidi Bou Said is such a popular place. If you plan to stay here in the summer, which is high season, book ahead. Restaurants cover the entire range, from cheap to the Pirates, reputed to be the best restaurant in Tunisia. Sidi Bou Said also offer some of Tunisia’s most famous cafés, like the overpriced but chic Café des Nattes and the romantic Café Sidi Chabaane. Far less than you might expect. Some hours after sunset, Sidi Bou Said empties. Down in the new town, you’ll find a bank that offers the usual services. Use the TGM, but note that early in the mornings and in the afternoons, as well as all day through in the weekends, it can become very full. Driving out here is also easy, and there are plenty of taxis that will help you out (Sidi Bou Said is considered part of Tunis, so you can use one of the small taxis).